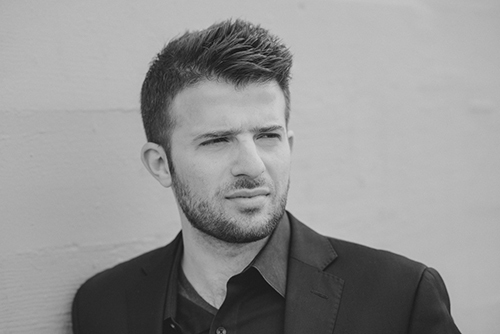 Dr Spyridon Antonopoulos is an active performer, choir director, and scholar, whose research interests focus on medieval Byzantine chant, archaeoacoustics, and music and identity. Dr. Antonopoulos obtained his PhD in Musicology from City, University of London, writing the first full length study on the fifteenth century composer, choir director, and theorist, Manuel Chrysaphes. While at City, he was awarded a University Studentship (2009-2012) as well as grants from the Higher Education Innovation Fund (2013) and the AHRC Cultural Engagement Fund (2013). He was a Visiting Lecturer at City, teaching two semesters of ‘Materials of Tonal Music,’ as well as a regular Guest Lecturer for ‘Introduction to Ethnomusicology.’ He won the 2014-15 Mercer's Company prize for academic excellence in recognition of his outstanding doctoral thesis. Dr Antonopoulos is founder and director of the vocal ensemble Psaltikon, which recently released the world premiere of the seventh-century Paschal Canon, in advance of its first international performance tour in May 2017. He is a regular singer with the internationally acclaimed ensemble Cappella Romana, with whom he has appeared at the Utrecht Early Music Festival, the Metropolitan Museum of Art in NY, and BBC Radio 3 with Sean Rafferty. A graduate of Brown University and the New England Conservatory, he has appeared as tenor soloist in operas and recitals of classical music, in addition to performing with a variety of world music ensembles, throughout the US, Europe, and the UK. Dr Antonopoulos has spoken at dozens of international academic conferences on medieval Byzantine chant, archaeoacoustics, and music and identity. His publications include forthcoming articles in Dumbarton Oaks Papers, Speculum Online, and Hesperia. He is currently a collaborator on Stanford’s Icons of Sound project as well as UCLA/USC’s Soundscapes of Medieval Byzantium. Both are interdisciplinary projects that focus on the intersection of sound, space, and liturgy in the medieval world. Recent performances include a modern reconstruction of music from the Asmatic Rite of medieval Constantinople in Stanford’s Bing Hall with Cappella Romana (November 2016) and an acoustically curated concert of medieval and modern Byzantine chant at Saint Sophia Greek Orthodox Cathedral as part of USC’s series Visions & Voices. Medieval Byzantine chant, especially kalophonic chant of the 13th – 15th centuries; Music and ritual and imperial Byzantium; Medieval and renaissance music; Performance practice; Eastern Orthodox liturgy; Greek folk music, rebetika, and, music and identity in Modern Greece. Summary: This thesis is the first full length study devoted to Manuel Chrysaphes, a fifteenth century composer, theorist and singer, who worked in the imperial court of Constantinople as a director of the palatine choirs under the final two emperors of Byzantium. He is the author of at least three codices, a theoretical treatise and approximately 300 chants, which range from simple psalmody to virtuosic chants composed in the florid, kalophonic style. A detailed analysis of Chrysaphes' settings of verses and troped refrains from Psalm 103 not only serves to update our knowledge of evening worship in Late Byzantium but also leads to an understanding of the identifiable elements of Chrysaphes' style as composer. Chrysaphes took the kalophonic tradition he inherited - a tradition of elaborate psalmody in which individual composers figured prominently - to its logical extreme, filling out repertories with his own compositions, innovating in certain areas, and defending the traditions of his predecessors elsewhere. Chrysaphes operated first and foremost as a self-consciously authorial composer. His prolific activity as author of hundreds of veritable 'art works' nevertheless leaves us with the impression that these were not detractors from, but rather, instruments of worship and spiritual perfection. “Soundscapes of Byzantium: The Acheiropoietos Basilica and the Cathedral of Hagia Sophia in Thessaloniki,” (co-authored with Sharon Gerstel, Chris Kyriakakis, James Donahue, and Konstantinos Raptis) in Hesperia, the Journal of the American School of Classical Studies (forthcoming). “Soundscapes of Byzantium,” (co-authored with Sharon Gerstel, Chris Kyriakakis, James Donahue, and Konstantinos Raptis), in Speculum Online (forthcoming). Kalophonia and the Phenomenon of Embellishment in Byzantine Psalmody, in Knowing Bodies, Passionate Souls: Sense Perceptions in Byzantium, ed. S. A. Harvey and M. Mullett (Dumbarton Oaks Publications, Fall 2017 expected). Entries for Gregorios Bunes Alyates, Gabriel Hieromonachos, and Ioannes Laskaris in Lexikon der byzantinischen Autoren (Oxford University Press, forthcoming). Entry for Manuel Chrysaphes in Pravoslavnaya entsiklopediya (The Orthodox Encyclopaedia). Edited by Patriarch of Moscow and All Russia Kirill. Moscow: The Ecclesisiatical Research Centre "The Orthodox Encyclopaedia." Vol. 37. Moscow, 2016. Entry for Dimitri E. Conomos in Pravoslavnaya entsiklopediya (The Orthodox Encyclopaedia). Edited by Patriarch of Moscow and All Russia Kirill. Moscow: The Ecclesisiatical Research Centre "The Orthodox Encyclopaedia." Vol. 36. Moscow, 2015. “The reception of Manuel Chrysaphes and his Treatise: narratives of continuity and theories of performance practice in Byzantine psalmody,” Conference Proceedings from the International Musicological Conference, “Crossroads. Greece as an intercultural pole of musical thought and creativity.” Thessaloniki, 6–10 June 2011, available at: crossroads.mus.auth.gr/wp-content/uploads/2013/07/CROSSROADS_PROCEEDINGS.pdf. “Princeton musicologist visits City: Internationally renowned musicologist, Kofi Agawu, delivers keynote lecture at City University London.” Summary of keynote lecture written for City University London Marketing and Publicity department, available here: http://www.city.ac.uk/news/2013/apr/ princeton-musicologist-vists-city. “Comparing the Treatment of Text and Melody in the Melismatic Kontakia and the Kalophonic Stichera.” Paper delivered at Workshop on Religious Poetry and Performance in Byzantium,Uppsala University, May 24-25, 2017. “Rebetika and Greek identity in Modern Greece.” Lecture delivered the Greek Consulate, Boston, MA, as part of the symposium and concert co-hosted by Berklee College of Music and the Greek Consulate of Boston, Vasilis Tsitsanis: His Music, His Life, Oct. 11, 2016. “Teaching Byzantine chant in the diaspora: the case of Boston, Mass.” Paper delivered at a study day between the Department of Music at City University London and its Erasmus partner, the Department of Music Studies of the University of Athens as well as members of the choir Cappella Romana and instructors and students of the School of Byzantine Music of the Archdiocese of Thyateira and Great Britain (London), May 24, 2016. “Some similarities and differences between Byzantine chant and Latin plainchant.” Pre-concert lecture (for Psaltikon’s concert, “Six Days before the Passion”), sponsored by the Rev. Michael C. McFarland, S.J. Center for Religion, Ethics and Culture. Brooks Concert Hall, College of the Holy Cross, April 24, 2016. “Soundscapes of Byzantine Thessaloniki: The Anoixantaria and the Acheiropoietos.” Presented at the BSANA’s annual Byzantine Studies Conference. Panel organizer of Perception and Experience of Byzantine Music in the Liturgy. Fordham University and City University of New York, October 2015. “The Kalophonic Heirmoi: A Case Study in Hearing, Intelligibility, and Performance in Byzantine Chant.” Sacred Song in the Late Antique & Byzantine East: Comparative Explorations, A Workshop Conference. Brown University, May 3-6, 2015.